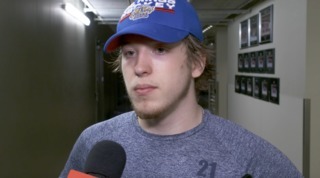 Friday night might rank as one of the most rewarding performances of the 2018-19 season for the Edmonton Oil Kings. 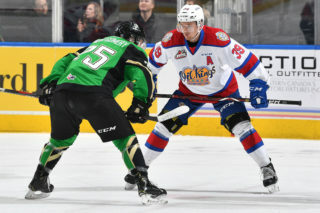 Conner McDonald and Trey Fix-Wolansky each scored twice and Todd Scott made 39 saves as the Oil Kings claimed a well-earned 6-3 victory over the CHL’s top ranked Prince Albert Raiders in front of 2,509 fans at Art Hauser Centre. 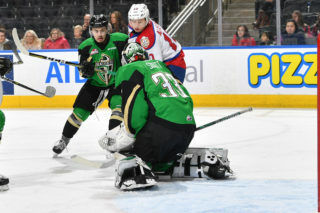 The loss was just the fourth on home ice for the Raiders (41-7-0-2) this season, while the Oil Kings (28-15-4-4) earned their first win this season against Prince Albert after, most recently, battling back to fall 6-5 in overtime on December 12. The Oil Kings are enjoying the fruits of their labours as of late, having picked up points in eight of their last nine games (7-1-0-1). Fresh off of being named the WHL Vaughn Goaltender of the Month for January, Todd Scott (7-1-2-0) turned out an exquisite and timely performance, casting aside all but three of the 42 shots strewn his way in goal for his sixth straight win. 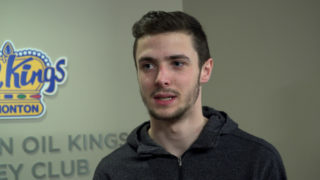 Vince Loschiavo (1G, 1A) and Quinn Benjafield (2A) also had two-point efforts to help propel the team to the gratifying win, which extends the Oil Kings lead in the Central Division standings with 64 points. 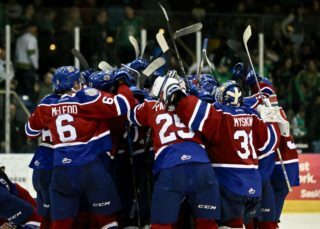 Ian Scott (28-6-0-2) took the loss, allowing five goals on 27 shots before being pulled in favour of former Oil King Boston Bilous just over five minutes into the third period. Bilous turned aside all four shots he faced in relief. It was the Raiders who opened the game’s scoring at 12:41 of the opening period on a goal by Cole Fonstad, and that was how things would remain heading into the first intermission. Shots on goal were 18-11 Prince Albert through the first 20 minutes. Nearing the eight-minute mark of the second period the Oil Kings squared things up as Jalen Luypen sniped his seventh of the season, banking a pass along the half-wall from Zach Russell, to knot the game at 1-1. McDonald continued his torrid offensive pace by giving Edmonton a 2-1 lead after breaking in all alone to beat Scott for his 13th of the season, unassisted. The goal was his fourth in three games and eighth point in his last six games. The veteran blueliner has registered multi-point games in each of his last three contests. Just over seven minutes later Fonstad picked up his second of the game to tie things up at 2-2 at 16:28, before Brayden Pachal restored the lead for the Raiders, 3-2, at 17:49. But the Oil Kings roared back as captain Fix-Wolansky notched his first of the night, beating Scott five-hole to once again tie the game, 3-3, less than a minute later at 18:25 on the power play. 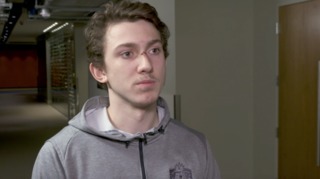 But they weren’t done there, as Fix-Wolansky potted his second of the night after a sweet pass from behind the goal line by Carter Souch found Will Warm, who one-timed a pass to the Blue Jackets prospect Fix-Wolansky for a 4-3 edge with just 39 second left in the period. Shots on goal shifted to Edmonton’s side of the ledger, 15-10, in the middle frame. In the third the Oil Kings kept their foot on the gas, as McDonald buried his second of the night at 5:09, from Vladimir Alistrov, after barreling in on the right side with a burst of speed to extend the lead to 5-3 and end the night of Scott. With 3:24 left to play and Bilous on the bench in favour of an extra attacker for the Raiders, Vince Loschiavo registered his 22nd goal of the season into the empty net to secure the win, assisted by Benjafield. Final shots on goal were 42-32 Prince Albert, which included a 14-6 margin for the Raiders in the third. Prince Albert was 0-for-5 on the power play, while Edmonton finished the game going 1-for-2 with the man advantage. Cole Fonstad (PA) (3), Conner McDonald (EDM) (2), and Trey Fix-Wolansky (EDM) (1) were selected as the Three Stars of the Game. The Oil Kings are back in action when they take on the Saskatoon Blades tomorrow night, Saturday, February 2 at 6:00 PM MT (7:00 PM CT). The team returns home to Rogers Place for another meeting with the Raiders on Monday, February 4 at 7:00 PM MT.